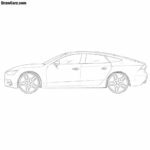 It is pretty hard to design an Audi R8 in a paper, but using this step by step sketching instruction you will definitely learn how to draw an Audi R8 easy. 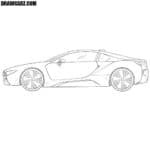 This article about drawing and hatching is not so sophisticated, and, having mastered it, you can draw this super car made by Volkswagen AG without much difficulty. In the first stage, we will draw auxiliary lines that will be helpful to us in the subsequent stages. 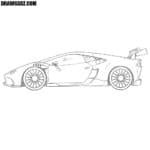 To do this, we depict the body of the Audi R8 using very common and rough lines. Focusing on the rough lines from the first and second steps design the front bumper, headlight and hood. Here we depict the top of the Audi R8, its windows and a mirror. Pay special attention to the roof, that flows smoothly into the back. On the side of the Audi R8 are many details. First you need to depicture the door, then numerous lines on the body. In the seventh step we will remove all auxiliary lines, draw the wheels and design the rims of the Audi R8. Make the tires thin and the rims big and cool. All that’s left is to add some shadows to the surface of our Audi R8. This will make our car cool and voluminous. We think that we were able to teach you how to draw an Audi R8. This instruction is useful for drawing a variety of options for this sports car, for example, if you want to depict an Audi R8 Spyder. We really like the Audi R8 not only because it’s a really cool and fast sports car, but also because it was the car of Tony Stark in Marvel movies. All that remains to be done is to paint the car. We leave it to you to do it yourself. We are very fond of black or white colors in cars, but of course you can paint your Audi R8 in any color, such as red or some super unusual giraffe color. This is the simplest scheme of drawing an Audi R8 from the side. We hope you enjoyed this sketching guide. 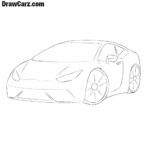 We are waiting for you in the next drawing instructions on the pages of DrawCarz.com.